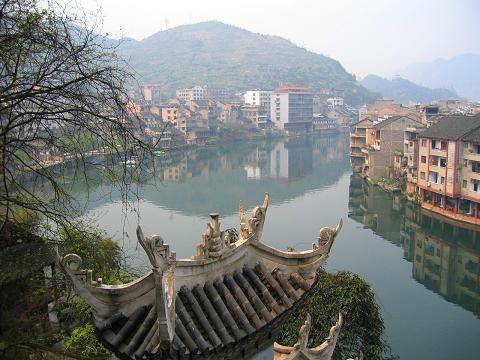 Zhenyuan is an ancient town in the eastern part of Guizhou province, 3 hours drive from Kaili. Zhenyuan Black Dragon Cave is an architectural complex of the Ming and Qing Dynasties consisting of six parts(Black Dragon Cave, Ziyang Academy, Zhongyuan Buddhist Temple, Longevity Palace, Prayer Bridge and Lotus Blossom Pavilion.) Its layout and design rely on a skillful incorporation of cliffs and architectural form. The town covers only an area of 3.1 square kilometers (about 1.2 square miles) but greets you with more than 160 scenic spots including caves, palaces, pavilions, temples and rivers with their unique architecture, exquisite engravings and marvelous natural landscape. Among them are the famous Wuyang River Scenic Area and elegant ancient complex in the the Black Dragon Cave (Qinglong Cave) - beckoning sights not to be missed by any visitor to eastern Guizhou. 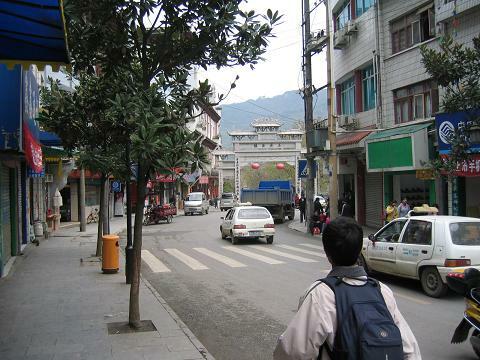 Zhenyuan is sheltered by the mountains. It is a land-and-water transportation center since early times. 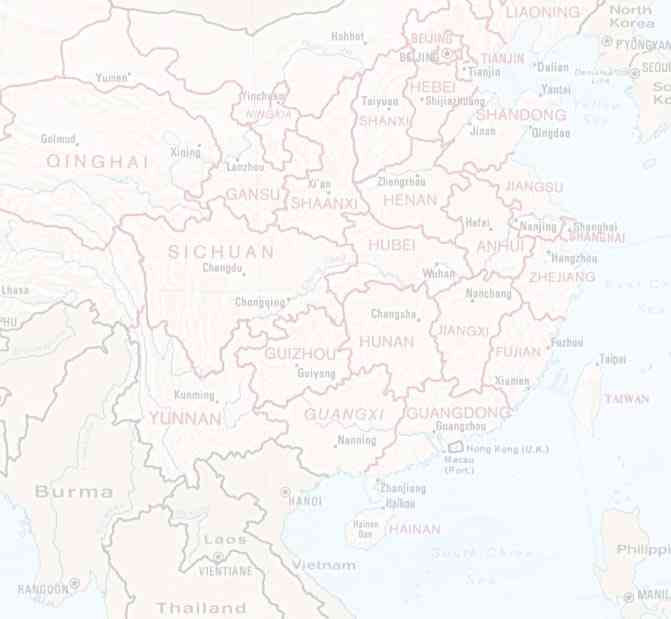 In 202 BC, the town became a county instituted by Han Gaozu, Emperor Liu Bang, and then in 1956 - the capital of southeast Guizhou Autonomous Prefecture. Cut through by the Wuyang River, the town is divided into two parts: south 'Wei City' and north 'Fu City', which forms a water town. Hence it is well-reputed as the 'Oriental Venice'. Wuyang Three Gorges, a 35-kilometer-waterway, is the most beautiful section of the whole scenic area. 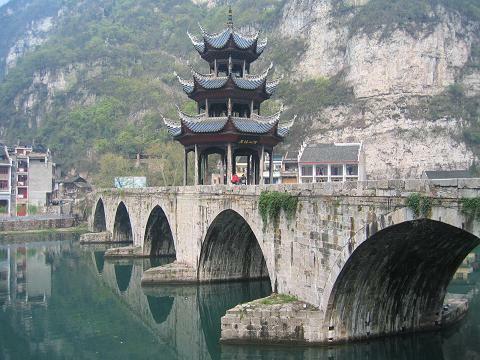 It consists of Dragon King Gorge, East (Zhu Ge) Gorge and West Gorge. Secluded caves, gurgling springs, rugged rocks, dangerous passes and spectacular waterfalls interspersed on the mountains of both banks along the three gorges endow the Wuyang River, along with the dangers of Yangtze River Three Gorges and the elegance of Li River in Guilin. Each scenic spot has been given a fanciful name according to their beautiful legends. Shanmu River is one of the ten scenic spots of the National Wuyang Scenic Area. The river is limpid, pure and a little greenish, which is well matched with the flourishing verdant plants growing on the surrounding mountains. Moreover, rafting on the Shanmu River is a most exciting and pleasant experience. After enjoying the rafting on Shanmu River, a visit to Mount Yuntai (Cloudy Terrace) should be on the itinerary. Featured with the typical Karst physiognomy, Mount Yuntai, wreathed in cloud and mist all year round, is a popular tourist attraction. Primitive forests, fantastic flowers and plants and enigmatic valleys, with rare animals moving lively through, make the mountain a natural treasury. Temples, pavilions and stone inscriptions built during the Ming Dynasty are well-preserved and towering on the Mountain. Since Buddhist followers used to prefer staying here to cultivate their morality, it has become an old-line Buddhist resort of Guizhou Province. Flowing through the Miaoling Mountains, the charming and lively Wuyang River runs 95 kilometers (about 59 miles) from Huangping to Zhenyuan, finally into Yuanjiang River in Hunan Province. Its scenic spots in Zhenyuan, Shibing and Huangping, three counties of Kaili, combine beautifully to form the National Wuyang Scenic Area. Famous for its beautiful landscape, historic sites and dense minority ethnic customs, Wuyang River Scenic Area, covering 625 square kilometers (about 241 square miles), is geographically divided into Upper (Shang) Wuyang between Huangping and Shibing and Down (Xia) Wuyang from Shibing to Zhenyuan. 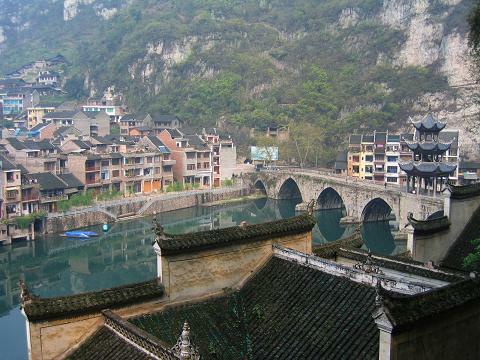 Within these two sections, the most sightworthy and impressive scenery could be enjoyed in Zhenyuan Ancient Town. Whether you walk along or take a cruise on the Wuyang River, it will bring you one surprise after another. Grotesque gorges, perilous peaks and crystal-like waters present a wonderful picture before you, as if you were entering a wonderland. 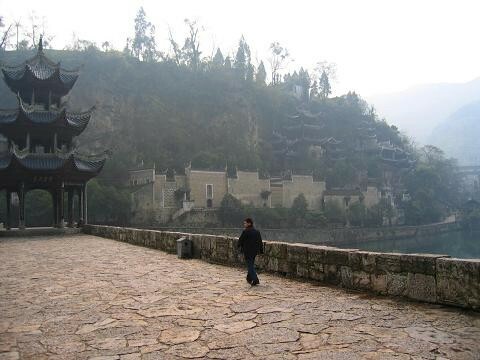 and is the centerpiece of the all ancient monuments in Zhenyuan. The Black Dragon Cave Temple is also known by including single and multi-storied pavilions, temples, shrines, palaces and so on. The Black Dragon Cave was built during the Ming Dynasty (1368-1644) and its current shape is the result of several renovations. With many separate buildings, the Black Dragon Cave encompasses Zhusheng Qiao (Zhusheng Bridge), Zhongyuan Temple, Ziyang Shuyuan (academy of classical learning), Yuhuang Ge (Jade Emperor Pavilion), Longevity Palace, Xianglu Yan. Among the ancient complexes of Zhenyuan, even if its close to the town, the Black Dragon Cave has preserved its natural appearance.